Leon Cortes - devout Catholic and a direct descendant of the Conquistador - has become drug overlord for all of the Yucatan because he believes his faith requires him to mortify his soul as his Savior mortified his body. Now he’s ordered by the Vatican to find the codex and send it to them. The 1500 year old codex contains an account of a holy man, a savior who is born under a bright star to a virgin, performs miracles, dies a horrible death, and is resurrected. If McNeery’s translation of the codex is correct, then something is radically wrong with the conventional accounts of the European discovery of the Americas. Or - and this is the only other possibility - something is radically wrong with Christianity’s notion of itself. 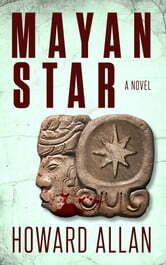 Mayans, drug lords and the solid heat of Peru. This book had great potential but for me it didn't quite unravel properly. It was well written but the content became confused with distractions such as certain relationships which seemed needless. A shame. Too bogged down with details ....... confusing start.